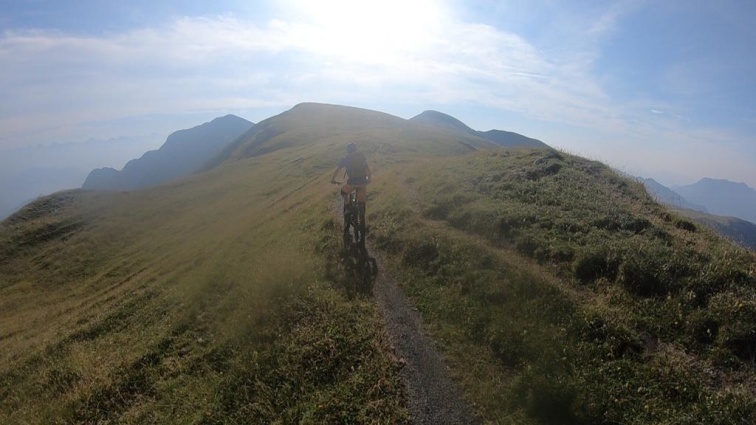 This trip are made for you who want to bike all mountain, natural enduro in the high mountains. You are used to singletracks, narrow paths with different substrates such as gravel, stones, roots and other technical challenges. You have good condition to be biking several days both up and down. All our trips has two guides for the possibility to split the group if it's needed and we love coffee breaks, good food and a lot of laugh. In all our 7 nights MTB trips we will have one day free for you to explore Bergamo city or just relax in San Pellegrino Terme or the nearby. Please also read "Is this right trip for me?" Flights are not included in our trips. Transfer on arrival and departure day from the nearby airports are included. Airports as: Milano/Bergamo Orio, Milano/Linate and Milano Malpensa. Do you use other transportation to reach us and Valle Brembana - let us know and we find a good solution for you. 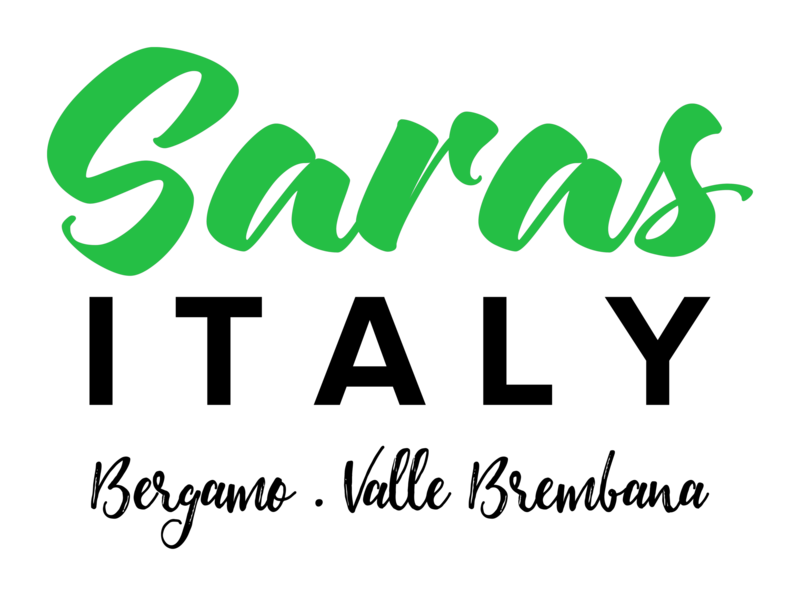 The trip has a minimum of participants and if the trip wouldn't be as sceduled, we will repay all your money and we let you know as latest as 30 days before departure. Welcome to San Pellgrino Terme anytime, let us know your flight and we will come and pick you up at the airport. Check in at our hotel***. We will meet late afternoon to go for a short walk in the historical village. Welcome dinner in the evening, when we also talk about our coming days. We go and check out our bikes and meet our guides at the bikestore nearby. This day we go for a ride in the valley, on old muletracks, up to small villages, stop for coffee and lunch. Technical stairs, narrow paths and some hight meters and flowy ways down all along the mountain walls. A first day to try our bikes and enjoying the area. Dinner in San Pellegrino. After breakfast we pack a bag for one night stay in the mountains.We put our bikes on the shuttle and go for a wonderful ride in the mountains. Lunch and coffee and then go again, wonderful views, several hight meters, balconyroads and tricky paths down. In the afternoon we go up to our Rifugio, mountain station, that will hold us for this night. We arrive late afternoon and will have a aperitivo and something to drink and then we will enjoy a good meel with traditional food and local products from the nearby area. The rooms are basic standard, we will sleep in several beded rooms, ladies and gents seperated, sheets and towels included. Food incl: Breakfast, aperitivo, dinner 2 meal course with wine, water and coffee. After breakfast we check out from our Rifugio to enjoy another wonderful day in the mountains. We start up in the mountains and will nice and easy go down back to the valley. After lunch we are heading towards San Pellegrino Terme and our hotel. Dinner together at local restaurant. Today you can rest your legs, sleep, enjoying the small village, maybe a hike in the nearby mountains or go by local transportations to our great village Bergamo. Here you can enjoy a good lunch, an aperitivo and just strolling around in the famous old city. We help you with ideas and maps. .. If you want to relax a fully day, we recommend Spa QC Terme in San Pellegrino, a great place for tired bodies. Pools, saunas and different treatments. Our visit our nice old Casino, you can join a guided tour. Day 6, Enduro with view over the lake of Como, sleeping at Rifugio or B&B. Once more we pack our bags for one night and put our bikes on the shuttle to go to the other side of the mountains. We will reach the beautiful area around the lake of Como. Old towns like Varenna, Menaggio and Lecco situated just near the shore, awaysome to drink a coffee here! 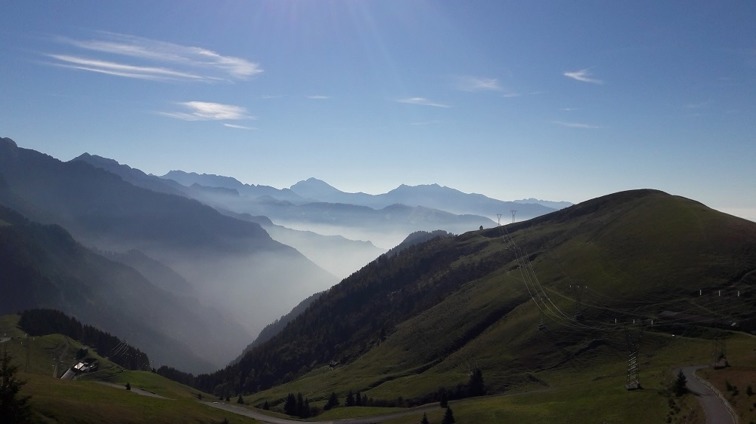 The ride today includes 2000 meters mountains and even views over to Switzerland... We will be sleeping at Rifugio or familiar B&B and enjoying a nice dinner. Food incl: Breakfast, dinner 2 meal course with wine, water and coffee. 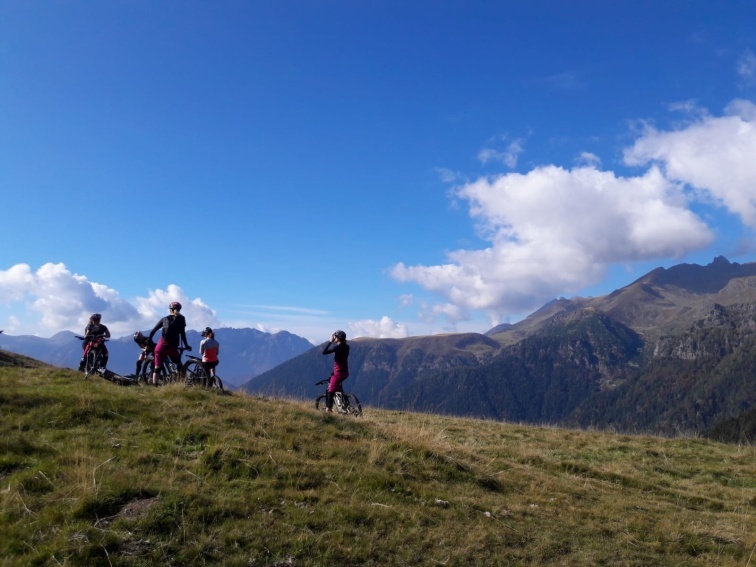 Last day biking and this time we reach our valley from the north side, our closest valley, Valtellina. The pass goes for 2000 meters and let us roll down in the Valle Brembana sometime around noon. Lunch break and then the last part to come back and leave the bikes. We celebrate our trip and say hi to our guides with an aperitivo at the hotel. After shower and resting at the hotel we go to eat dinner in the village. Food incl: Breakfast, aperitivo and dinner 3 meal course with wine, water and coffee. Tell us when you need to go to your flight and we will do the transfer. Do you wish to stay extra nights or transfer other days, please let us know and we will have the possibility to help you. We do really like to go out in the mountains and it is not often we have to close a trip. If it should be so, the participents are less then 4p, we let you know at least 30 days before departure and we will refund all your money. The accomodation will be at Villa Chiara B&B and apartments (or similar) includes part in 2- or 3 bedded room, breakfast, sheets and towels. Accomodation in the Rifugio, easy, cosy and familiar, includes sheets and towels and we share several bedded rooms, ladies and gents separately. The toilets and showers can be shared outside the room. To give you the best experience in this amazing area, we use E-bikes, Specialized Levo, made for all mountain and freeride. 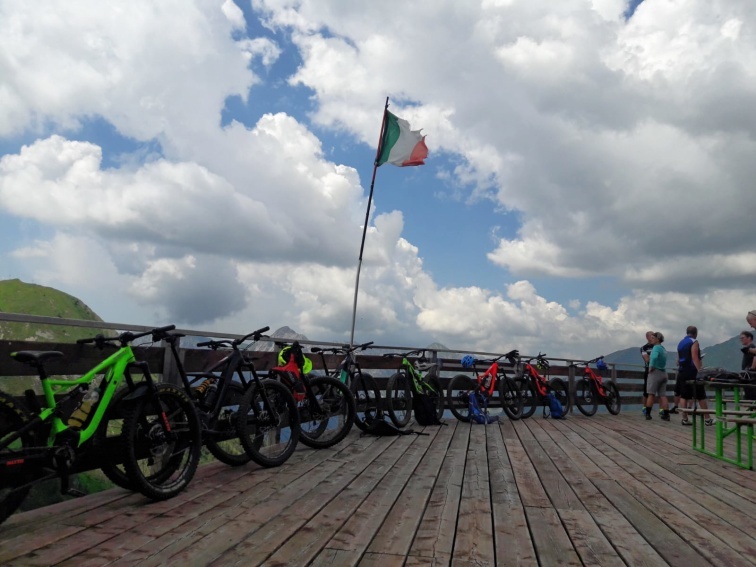 The bike gives us the oppurtunity to reach the top and the start of the trails, without using the shuttle or liftsystems. Before you go and bike with us, please check your personal insurance for the activity Mountain biking. If you are from an EU country, please bring your EHIC insurance card. If the bikes will get damage, you have to pay all the cost included for repairing the bike at the bike center. Before you leave you will have the oppurtunity to buy an insurance frome the bikeshop. 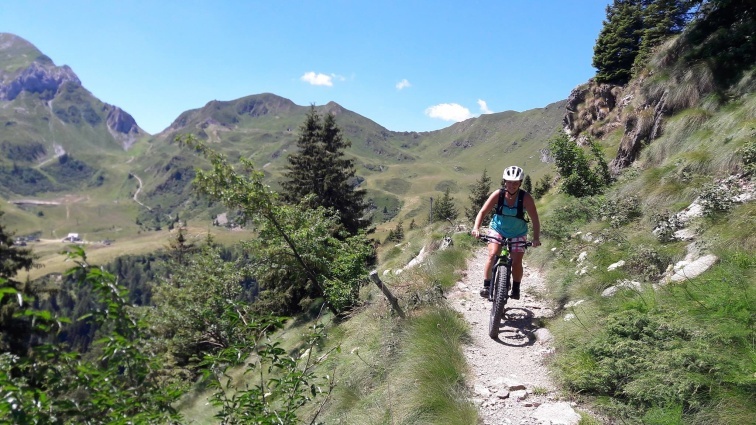 All MTB tours with local guides speaking eng/italian. All transports between hotel, tours and excursions. Transfer on arrival and departure day from the nearby airports. Please check all the letters! I have the checked my insurances! At the Rifugio in the mountains, 2 nights, we will sleep in several bedded rooms. We are traveling together and want to share room, 2-3- or 4 bedded. If you are newbeginner for MTB All mountain, this trip is not a good level for you. Please contact us and we will find a better solution! 4) I have tried bikeparks and other downhill/enduro trails. Please let us know and we will prepare as much as we can.